Enjoy breathtaking sunset views from your pool size backyard & covered patio? 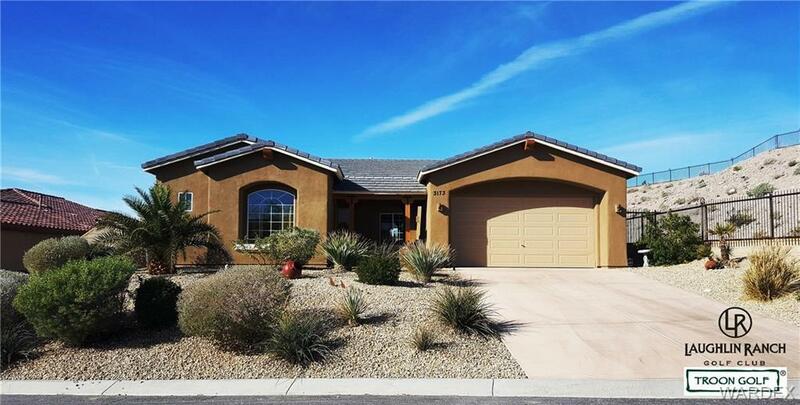 If so, come check out this rarely used & TURN-KEY 3 bed 2 1/2 bath home in the Troon Golf Managed Gated Community of Laughlin Ranch. This gorgeous 2007 build is located in a quite cul-de-sac & features a spacious 2,035 sf open floor plan with all of the special touches that makes this home a must see including a gorgeous courtyard sitting area with covered ramada, breakfast bar, granite counters, 20 x 20 tiled floors, stainless steel appliances, casual & formal dining rooms, new faucets, ceiling fans throughout & so much more. The elegant master suite boasts plush carpet, granite counters, dual sinks, large walk-in tiled shower with custom wood plank accent wall, and walk-in closet. The split floor plan makes for added privacy with guest bedrooms joined by a Jack & Jill full bath. If you need room for the toys, this home has you covered with a two car, 32' boat deep garage with 8' doors. A freshly painted interior & exterior, water softener & reverse osmosis, fantastic covered patio w/ drop down sunscreens, this home is the gem in the desert. Come enjoy the desert scenery from your west facing backyard which looks out onto the spectacular mountain ranges & not your neighbor's backyard. The fully landscaped front & back yard features easy to manage plant drip system as well. This gated community home is walking distance from The Laughlin Ranch Clubhouse, which offers a top notch restaurant, pool, gym, world class golf course, day spa and so much more. A truly one of a kind community on the Bullhead Parkway that is minutes away from the Colorado River, Lake Mohave & Laughlin Casinos. Schedule your showing today & take the 1st step in making this house your home!